What you don’t know can hurt you! Brandle begins a social media audit by looking for points of presence (POPs) across the web that match your brand – authorized or unauthorized – and brings them to your attention. Claim, ignore, or investigate them. Throw away the spreadsheets and use a collaborative system to keep track of your web and social properties. Manage your data with tags. Create a hierarchy of your brands and identities allowing you to visualize your social data and footprint. Brandle is the first step in protecting your brand online! Brandle Patrols for your brand and trade names on a weekly schedule. Receive alerts when new web or social properties are created using your brand. Brandle keeps auditing the web so you never are out of date! There are a lot of stakeholders in a social business: Marketing, Sales, Support, Legal, IT, Products, and more. Brandle let’s you manage tasks and work with team members across the enterprise (and with vendors). Quickly review your corporate and employee POP profiles ensuring that regulatory compliance and brand standards are met. Receive alerts when changes are made to the credentials of your social accounts. Email corrections to POP owners & issue reports to executives. Need to manage and monitor your entire ecosystem of employees, partners, and vendors? 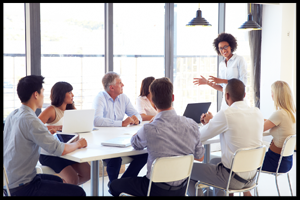 Easily document what belongs to the company and what belongs to your employees, fans, advocates or partners. 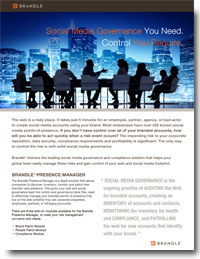 Brandle centralizes and empowers your social team while keeping ownership boundaries clear. Brandle and CyberArk announce new Partnership! 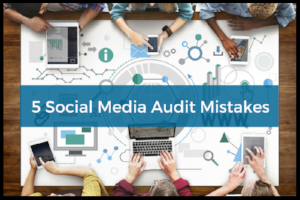 You already know how challenging it is to conduct a global social media audit, so make sure you know these mistakes before you get started! Each is rated with risk level and frequency to help prioritize. Read article now! 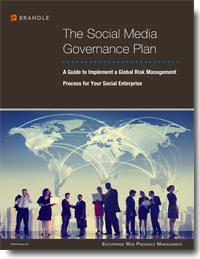 E-Book – The Social Media Governance Plan. This E-book guides you through the process of creating a comprehensive and corporate-wide Social Media Governance Plan for a Social Enterprise. Learn how to mange your social media risks across the globe! Download now! 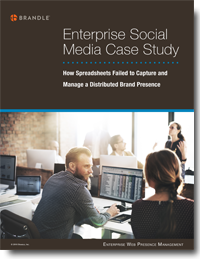 CASE STUDY: Enterprise Social Media Audit. How Spreadsheets Failed to Manage Global Risks. See how a major global enterprise was able to discover and inventory almost 50% more of their web presence when they turned to Brandle. Manual audits and multiple spreadsheets fail to manage the risk to brand! Download now! Brandle Presence Manager Data Sheet. Do you have a handle on your brand? This data sheet gives you information about the Brandle Presence Manager and how it helps any enterprise discover, inventory, monitor and patrol their social media footprint. Download the data sheet. Brandle®, Inc. is dedicated to providing a comprehensive system for companies to manage the properties of their brands, identities, and relationships across the web and on all major social networks including Facebook, Twitter, YouTube, LinkedIn, Google+, SlideShare, and Pinterest. It is our mission to become the trusted source for web presence management. We are committed to adding functionality that allows the enterprise to manage, secure, and protect their brands and web properties.